Concrete safety barriers offer a sustainable solution for road safety. They are available in a wide range of products, from temporary workforce protection in a work zone, to the highest containment levels for heavy goods vehicles. 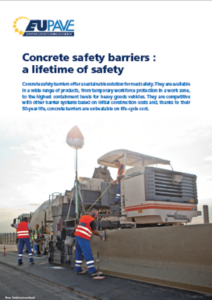 They are competitive with other barrier systems based on initial construction costs and, thanks to their 50-year life, concrete barriers are unbeatable on life-cycle cost.